I have had a PlayTV attached to my PS3 to turn my games console into a Freeview PVR for a few months now and after wanting to write about it for months I thought I would finally get around to it. 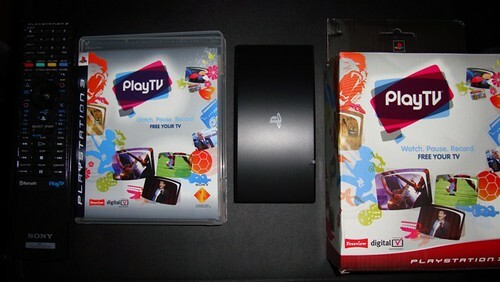 I bought the PlayTV to replace my existing Sagem Freeview box, which was getting a bit old and using my PS3's existing hard drive the PlayTV would allow me to record TV. Setting up the PlayTV is very simple all I needed to do was plug in my existing coaxial cable into the PlayTV and then plug that into the PS3 via one of the spare USB ports on the front, however the USB cable sticking out the front is a bit noticeable. The kit also came with a sticker to stick on my existing PS3 remote so it would label what the buttons on the remote would do with PlayTV. Once I turned my PS3 on I just popped in the supplied DVD and the software installed within a few minutes. Once the software has installed the PlayTV shows up in the Playstation 3's XMB in between the Video and Game options. When you go into the PlayTV the menu system is easy enough to navigate and reminds me of Apple's old Front Row interface with options appearing in a circular shape. You get a weeks worth of TV listings in the guide and as far as recording features there's nothing amazing but you record and pause live TV as well as setting up scheduled recordings. Navigating through you recordings isn't too difficult as they are just in a list format and you can change the sort order to help you find what your looking for. The picture quality is good and on a par with some stand alone PVRs. However the picture does freeze for a second every now and again, but this is somewhat rare. When I first got the PlayTV I did notice a few issues such as the guide taking a few minutes to load however this seems to have been fixed in a software update. My PS3 came with a 60GB hard drive which due to the amount of programs I recorded filled up very quickly and instead of just deleting some of the programs I had watched I choose to replace my PS3's hard drive with a larger 500GB hard drive. Replacing the hard drive wasn't too difficult after watching a few clips on YouTube on how to replace my PS3's hard drive and only took a few minutes to swap out the drives (however it took over an hour to back up my data and over another hour to restore my data on my new hard drive). Nice summary of getting the system set-up, Adeel. How do you find the fan noise of the PS3? On my 60GB revision PS3 the fans tend to kick-in after 30 minutes, similar to watching when a DVD/Blu-Ray film. I can sometimes hear the fans kick in after a while but to me it's not really noticable when there is sound coming from my speakers.